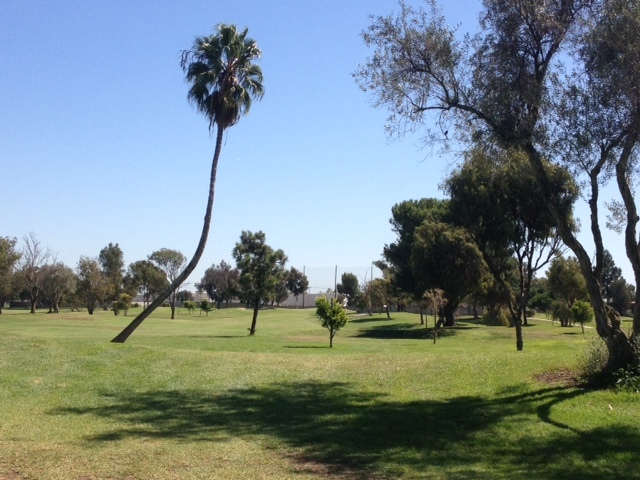 This post was originally going to be about the same experience I’ve had – or witnessed – on two of Pala Mesa’s par-3s that I’ve never seen or heard of happening anywhere else. But then I played the course again and realized nothing about any of Pala Mesa’s par-3s is easy so I thought I’d just go ahead and profile them all. No. 16 is the shortest par-3 on the course. From the blues, it plays 143 yards, albeit uphill. When you look at the hole, you see a steep face bunker on the front left and a face bunker back right, with the green sandwiched in the middle. What you don’t pay attention to is the cart path snaking to the left and then out of view. It ends up uncommonly close to the green. While playing in a tournament last year, a player in our group pulled his tee shot left on this hole. He then walked to the side of the tee box and stood there. Sure enough, about 30 seconds later, his ball came bounding back on the cart path, following a winding path with uncanny consistency. The golfer grabbed the ball and put it in his pocket, choosing to take the max strokes on the hole rather than recover from a negative tee shot. Yes, the ball was going to end up behind the tee box. Anyway, I’ve heard this is a fairly common occurrence, and I saw the same thing happen on the par-3 No. 3 as well the first time I ever played the course. Crazy stuff. So when I write full review of Pala Mesa, right on No. 3 and left on No. 16 will be prime “Do NOT Hit it Here” material. As a group, though, the Pala Mesa par-3s are all tough and show that you don’t have to stretch a par-3 to 200 yards to make it difficult. Even from the tips, the longest par-3 is only 189 yards. The blues measure 166, 159, 151 and 143. But what they lack in distance, they make up for in difficulty by being tough to club due to the wind and even tougher to putt, with slick, undulating greens. And wicked sand traps guard part of the fronts of all of them. We’ve already talked about 16 in-depth. Here are the hole details on the other three (using yardages from the blues). No. 3, 166 yards – This is the longest of the four and plays into a narrow, oblong green with heavy mounding off the left side. The hole often plays into the wind, making club selection tricky and bringing the traps into play for a very tough recovery if you miss short. But if you go long, you’re likely OB as there’s not much room. It’s a one-club green, and you’ve got to pick the right one. Anyway, missing right here would be a good miss, save for the cart path repercussions we discussed. Miss really right and you avoid the path and have a safe chip, especially since the pin is often on that side of the two-tiered green. I parred this hole the first time I played it. I haven’t been so fortunate since. No. 7, 159 yards – Another narrow, sloping green with sand traps short that get a lot of play. And if you miss short right AND miss the trap, your ball runs into a ravine, where you may be blocked by a tree. Also, long is gone again. So hit the green or look at a killer up-and-down. I’m always short here so I’m going to suggest the hole plays long. I can’t recall ever making a good number here. No. 14, 151 yards – Plays uphill and to a crosswind, so take an extra club. Many don’t and are left to fight there way out of a huge bunker complex. This green is deeper than the other two, so you’ve got room if you go a little long. And left is an OK bailout. When you reach this green, putting again becomes the issue. I get the yips just thinking about some of the green speeds I’ve seen on this course. Makes it tough to charge the hole, even for birdie. In fact, that’s how birdies become bogies here. Remember, par is always a good score on these par-3s. 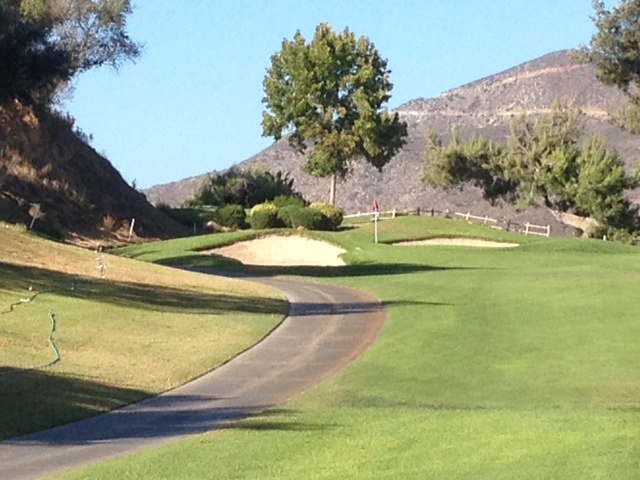 If you haven’t played Pala Mesa, it’s just off the 76 in Fallbrook. If you go, get ready for a test. I first played here my first week at the Golf Academy. I shot well over 100 and seriously doubted if I’d ever have the game to match this course. Well, I broke 90 the other day, so, yes, I can now play this course competently, but the green speeds were off. When they’re fast, this course can be very tough. Even when I’ve hit well, I haven’t made putts here, and that tends to wear you down over a round and eats at your confidence. Take one hole at a time here and over time hopefully you’ll come to appreciate, as I have, the good test of golf that Pala Mesa offers. But if you hit the cart paths, you can’t say I didn’t warn you. 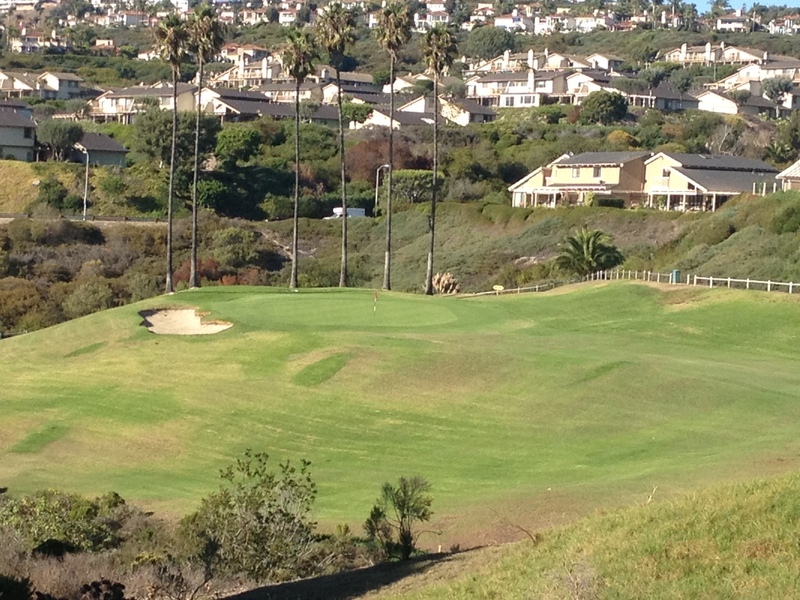 While playing Monarch Beach last spring, I received a course recommendation from two Orange County playing partners that stuck with me: the municipal course at San Clemente. I had been in California for eight months and that one was new to me, even though I’d played in the San Clemente area before. “Ocean views, great value and a course that will surprise you,” they said. Intrigued, I filed it away for future exploration. Well, on Monday, I realized my afternoon was open and decided it was a good day for a break from my regular course rotation and recalled San Clemente muni. What I discovered was a course that fit what I was told to a T and certainly exceeded my expectations. I’ll definitely be back and want to relay to you a little of what makes this course special. For this feature, I’ll suspend the course review format and just give you an overview, some course history and a few hole highlights. The course begins in a very familiar muni-style – wide, straight, flat – for the first five holes, but then gradually morphs into a different course and ultimately a drastically different, and unexpected, experience on the back. I was fortunate to walk on with two playing partners who were very familiar with the course and its history, which I knew very little prior of to Monday. 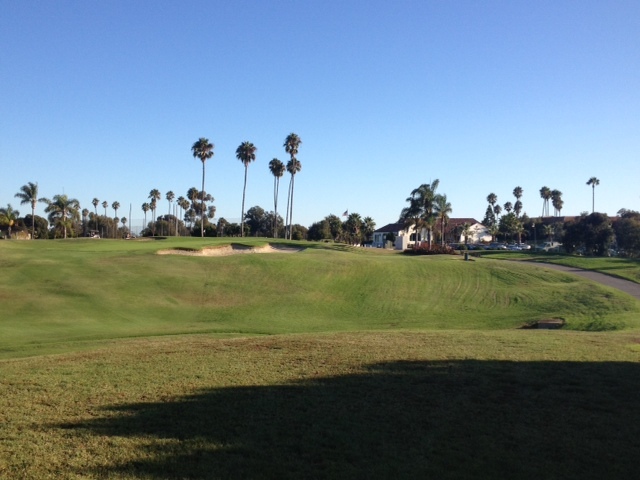 The San Clemente Golf Club has long been a favorite of Southern California golfers. Built by renowned Golf Course Architect William “Billy” Bell on land donated by city founder Ole Hanson, the course consisted of nine holes on opening day in 1930, with what is now the back nine being added in 1955. 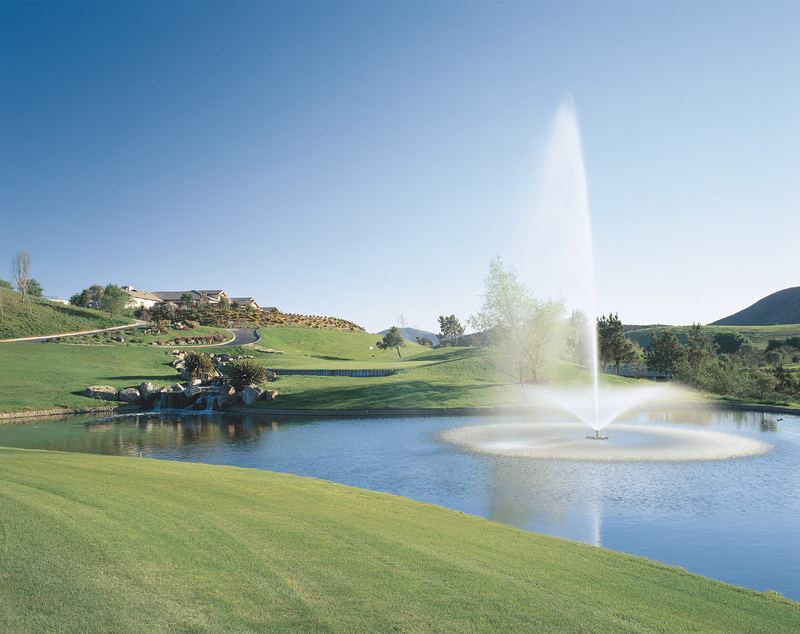 The golf course boasts sweeping ocean views, interesting elevation changes, a challenging-yet-fun layout reminiscent of the golden age of golf, and best of all, reasonable green fees. The moderating influence of the Pacific Ocean ensures frost-free winters and cool summer breezes. Popular from its very beginning, San Clemente now hosts roughly 95,000 rounds per year, making the “muni” one of the most popular courses anywhere. Those familiar with California golf architecture will recognize William Bell, the designer of many California public courses, including, most notably, Torrey Pines. Like I said, the first five holes are fairly straightforward, but then you get to six, which is a dogleg right, uphill par-4. It’s the first time you really have to work the ball and, well, being in the trees on the left, I had my work cut for me. This hole finishes next to the clubhouse and then you cross the road and discover three holes that foreshadow the experience you get on the back. There’s an uphill par-5 going out that plays longer than the 485 on the card, and then you’re pointed back toward the coast and get your first true glimpse of the ocean. It provides the backdrop for a whole lot of golf hole – a 419-yard par-4 into an ocean breeze and buffeted by bunkers. Given what you’ve played up until now, it’s a bit jarring to be faced with such a stiff test, but it serves notice that the course plans to challenge you from here on out. Previewing the back, one of my playing partners told me, “You’ve got some very special golf holes coming up.” And after three holes that were more reminiscent of the start of the course, he was right. No. 13, 205-yard par-3: You’ve got the ocean breeze at your back as you stand looking at a fairway that’s steeply sloped on the left side and will kick your ball right. I hit what felt like a flushed 5-iron and came up short. Apparently the hole plays a bit long, too. No. 14, 304-yard par-4: Yes, you read that right – 304, seemingly a baby par-4, or is it? Hardly. The whole plays dead uphill through a somewhat narrow fairway to a green surrounded by bunkers. Play for placement here. Iron or hybrid off the tee and then get ready for an approach to a green that slopes away from you. Not all what you’d expect from just looking at the scorecard and the beginning of a golf roller-coaster ride to the finish. No. 15, 196-yard par-3: An elevated par-3, and the course’s signature hole. And what a view. Again, ocean breeze at your back and gorgeous green and palm trees below. I decided not to club down here and didn’t regret it. I needed every yard and found a little bail-out area right for an up-and-down par. 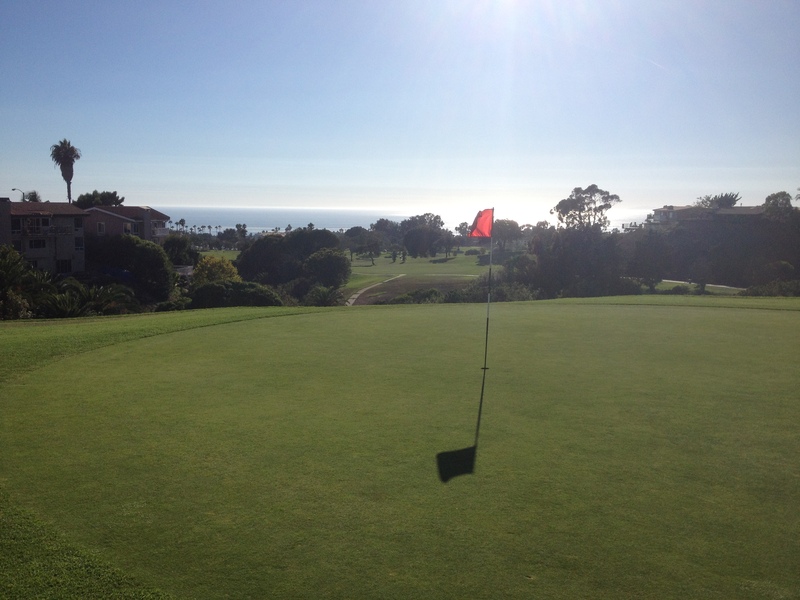 Part of the reward for reaching the green here is that you get your first fully panoramic view of the ocean. And it’s stunning. No. 16, 387-yard par-4: The trickiest tee shot on the back as it’s a dog-leg left with a huge cluster of trees blocking the middle of the fairway. You can glimpse the green to the left. You choices: Carry a chasm 250 yards and try to get close, or hit it out right and play safe but have a long approach. What you don’t see from the tee is the drastic drop off in the middle of the fairway. You need to layup to about 150 yards to avoid having a downhill lie to an elevated green. A lot going on here. Choose wisely. No. 17, 358-yard par-4: The back closes with parallel par-4s. As is often my fate with parallel holes, I found the opposite fairway and ended up chopping out of thick grass. Thus, I recommend hitting the fairway here and taking the easy road on this uphill hole. No. 18, 408-yard par-4: You close your round with the ocean on your right and the clubhouse in the distance, a fantastic finishing panorama. It’s a great finishing hole that slopes downhill at around 150 yards to reward big hitters. 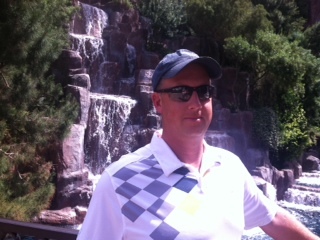 Provides a great chance for a finishing birdie if you sink that last slick putt. Since we teed off around 2, when walked off, the sun was setting behind San Clemente Island, which you can get a glimpse of from the practice putting green. It was the last beautiful surprise in a round full of them. I truly enjoyed my round here and will surely be back. I’m trying a new format here that’s different than what I’m doing in print. I’d appreciate a little feedback as to how useful you find it since it’s a work in progress and here to serve people discovering these courses for the first time and those of us who just enjoying talking about this stuff. The overall intent is to give as complete a picture of the playing experience as possible, from the aesthetics to the food to how to prepare to play the course, and mix that with handy tips about actually playing the course. When I moved out here a year ago and played many of the courses I’ll discuss, one of my frustrations was finding info. about the courses that was beyond the standard length, location, who designed it, etc. Anyway, this is an attempt to fill that knowledge gap. It should be like the course knowledge you’d get standing on the tee with a local familiar with the track. Hold Onto Your Hat – Where trouble lurks and the round might get away from you if you’re not careful. Best Chance to End Up Buying A Round for the House – Your best chance for a hole-in-one. Unlikely, yes, but still fun to think about. You’ll Want To, But Don’t … – The shot that tempts you … and the smart play you should make instead. Take a Picture – A visual highlight of the course, which out here can be many. On the Range – What shots/clubs I need to be ready to hit to play this course well. Every course has these, but you don’t know them until you’re done. And this is the type of info. I’ve never been provided about any course that can really make a difference in your round. Anyway, the subheads and themes will evolve with each review, but this gives you an idea of what I’m going for here. I hope you find these reviews informative and useful and that they enhance your playing experience if you happen to play one of the courses I review. 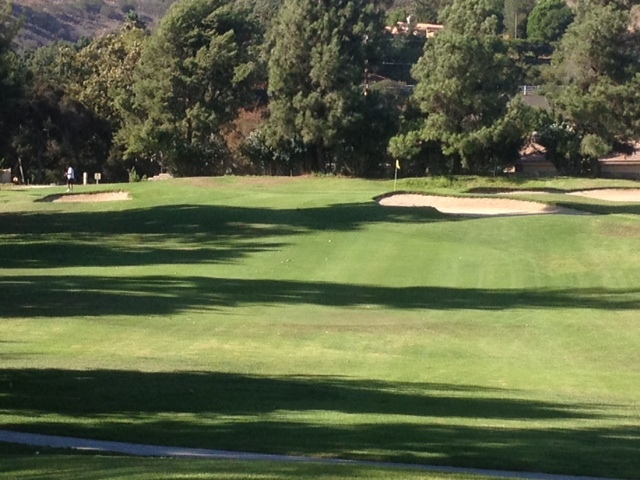 If you happen to play Twin Oaks, best of luck, and enjoy your round. And try the potato chips. As the name suggests, Twin Oaks is a tree-lined local favorite in San Marcos. Despite the trees, however, the course allows you to swing more freely than the name, and the first impression you get from the opening holes, might lead you to believe. Twin Oaks is a mid-length course where driver-wedge is a common club combination if you’re striping it off the tee. Birdies and even eagles can be found here on a good day, but perhaps the best thing about a round here is that sunshine is prevalent. Nearly every round I’ve played at Twin Oak has been bathed in sunlight with a gentle, and occasionally gusty, breeze that keeps the course comfortable. Make sure your wedge game is dialed in. You’ll hit plenty of them, even if you’re only driving the ball reasonably well. You’ll be flying it in to many of the holes here. For various reasons, including pace of play, most courses ease you in with a few relatively easy opening holes. Not Twin Oaks. When you step on the first tee, you’re hit with the toughest part of the course first. Because of tight, tree-lined fairways, there’s a premium on accuracy for the first four holes. In fact, it’s not a bad idea to bag your driver here and hit hybrid or long iron. You can easily go OB here and add strokes to your card in a hurry. Better to keep it in play and trade 20 yards or so off the tee for a spot in the fairway and hopefully survive this otherwise benign opening stretch mostly unscathed. The par-5 No. 5 is a true grip-and-rip hole and a preview of what much of the rest of the course is like. Plenty of room to operate here, so hit it long and maybe get home in two. Anything over par here feels like a major missed opportunity. The remaining 5s, and some shorter par 4s, particularly No. 8, are holes where a big drive can pay big dividends. No. 7 is the trickiest par-3 on the course. Club selection to this tiered green is huge here and also takes some calculation. Pin location, wind speed and tee box position – they move it all over the place – all play a factor here and can mean hitting anything from sand wedge to seven iron. Choose carefully, swing confidently. When the pin is on the lower tier, you can use the ridge as a backstop. As dastardly as No. 7 can be to play, it’s a real beauty when the Lilly pads are in bloom and provide a pleasing floral accent to the hole. Hopefully you won’t be looking for your ball beneath them. No. 9 is a downhill par-4 with a creek carry to an small green. When the wind is blowing in from the west, factor an extra club, or even two, on your approach. The hole is normally plenty scoreable, but if the pin is back-right, take par if you can get it and be happy about it. If you’re in need of a snack for the back, 2 Oaks Pub offers a unique treat: homemade potato chips. Grab a bag for the back and enjoy. The back begins with a longish par-3, usually played with a strong crosswind. Miss left or short, but DO NOT push one into the bunker of the right. It’s a tough up-and-down, made nearly impossible by the overhanging tree that covers half the trap. Note: Careful on a recovery shot from the left side because those have been known to find the trap as well. Hit driver on No. 15, a severe dogleg-left par-4 that plays up to 350 yards. It’s tempting, especially if you hit a draw, but there’s little reward for the risk of unnecessarily bringing huge water on the left and sand dead-ahead into play. Sometimes there’s something to be said for letting an easy hole play easy. Just float a rescue or iron out right and be happy with a wedge shot into a receptive green. Your round may be able to use a painless par at this point. The par-5 No. 16 can trip you up in you’re not careful. Maybe it’s the off-set tee box, but tee shots have a way of going right here and either end up OB or tree-trapped. Left is no picnic, either, thanks to a bunker complex. If you’re hitting it great and straight, by all means fire way. If not, checking down to something that gives you 220-250 yards in the fairway may be your play. Avoid trouble off the tee and there’s little left to worry about besides an occasionally tricky pin position. You can make a case for No. 3, but I’m going to go with the straightaway No. 17. It can play up to 194 yards, but often plays much shorter and has a green with several receptive pin placements. You can be aggressive with this one. You avoid big trouble early in the round and spend the rest of the day playing catch up, although you can certainly do it on the back. You can steal a birdie from the opening holes and take advantage of the very score-able par-5s and 4s. A scorecard full of pars and a few solid birdies, particularly if one of them is on the par-3 No. 7. There’s a something especially satisfying about getting a two there after negotiating the water, wind and a green with a huge ridge in it. If the pin is on the lower tier, you can have fun watching the ball filter back to the hole and maybe give you the shot of a lifetime.